One of the things I’ve learned about eating on a budget is that simple recipes win. The fewer ingredients you need, the fewer ingredients you need to buy, and that generally helps keep that grocery bill low (not to mention, it makes cooking easy). So, when I was planning for the first week of my September Challenge, my favorite dinner “cheat” recipe came to mind. 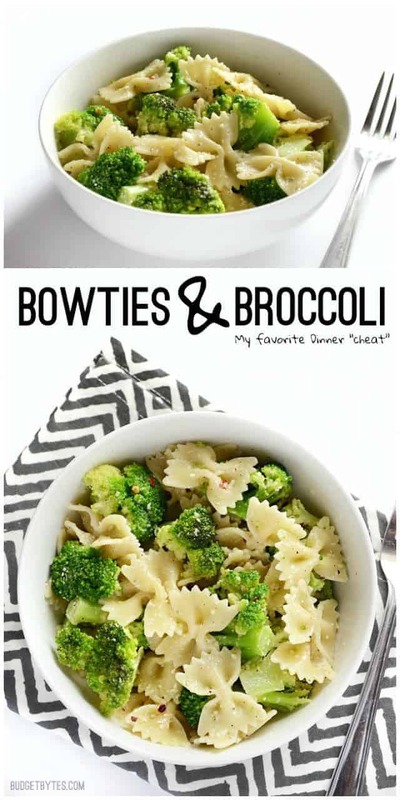 Bowties and Broccoli, FTW. 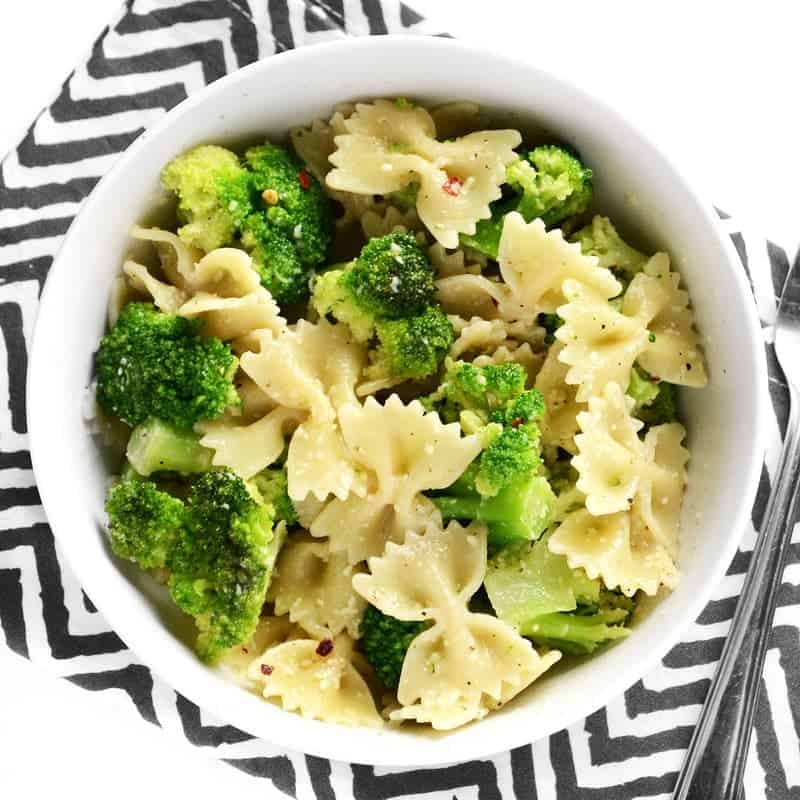 The quantities on the recipe card below are for six servings of the Bowties and Broccoli. I generally make one serving at a time. To find the quantities for one serving, scroll down to the step by step photos. This insanely simple dinner "cheat" is ready in minutes and will keep you full for hours. 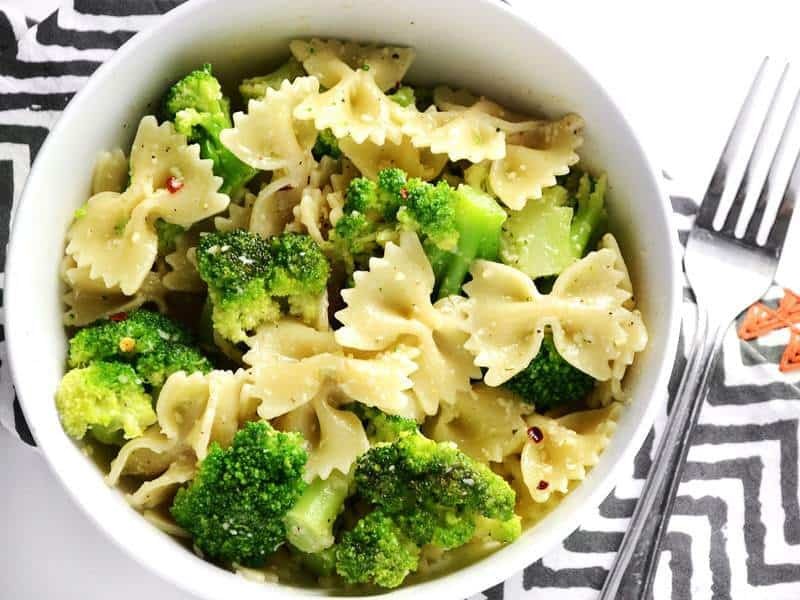 Bowties and Broccoli is my go-to lazy weeknight dinner. Bring a pot of water to a boil, then add the pasta. Boil until the pasta is al dente (7-10 minutes). 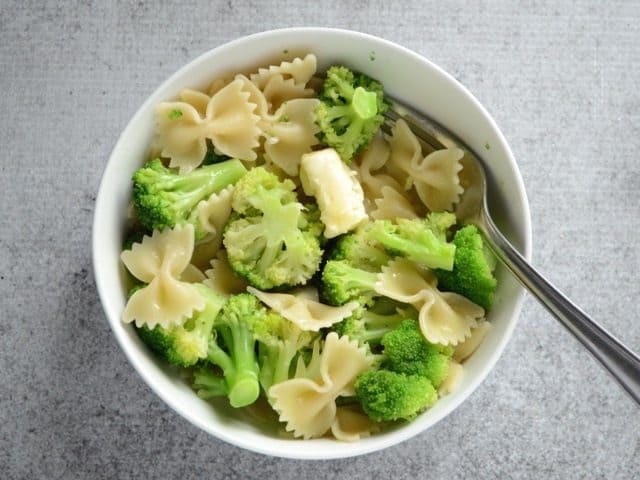 Add the frozen broccoli florets to the boiling pasta water, turn off the heat, and let sit for 1-2 minutes, or until the broccoli is tender-crisp. 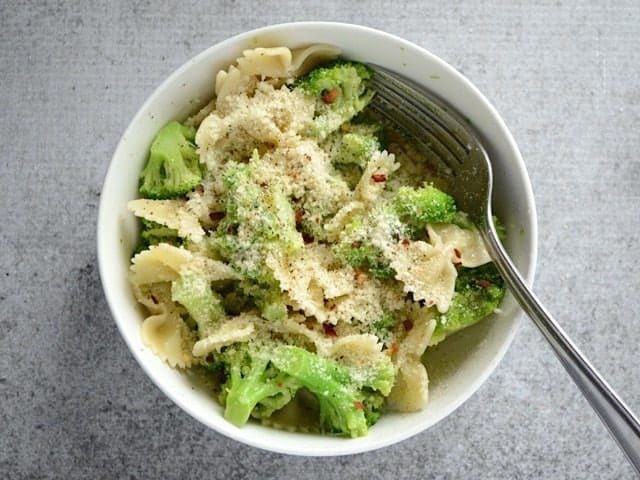 Drain the pasta and broccoli in a colander. 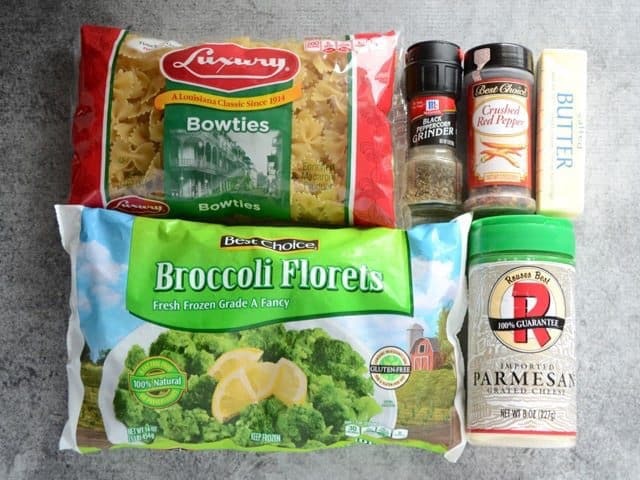 Transfer the pasta and broccoli back to the pot (with the heat off) or to a bowl and add the butter. Toss until the butter has melted and coated everything. Add the Parmesan, salt, freshly cracked pepper, and red pepper flakes, then toss to coat again. Taste and adjust seasoning as needed. Serve immediately. It always amazes me how just a couple of ingredients can make such a satisfying meal. This really is SO simple and SO good. I keep these ingredients stocked and eat this often. This is all I need for about six servings (not all of the butter, Parm, and pepper were used for six servings). 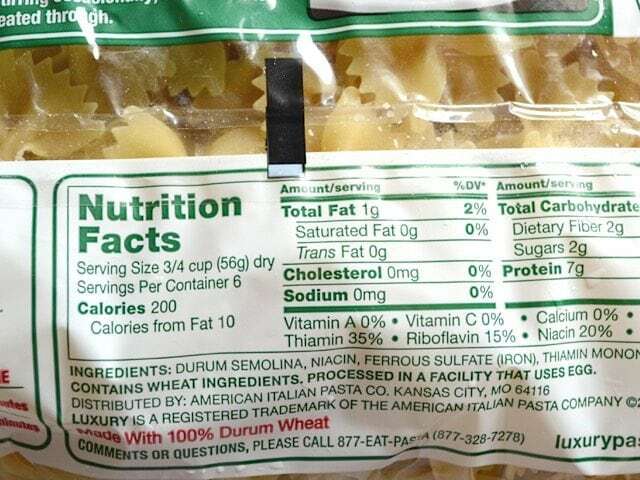 If you’re making one serving at a time, you can either estimate 1/6th of the bag of pasta, or check the back to see if it gives a volume of dry pasta for the serving size. The measurement will change depending on the shape of the pasta, but for this bowtie shape 1/6th of the bag is roughly 3/4 cup. So that helps me keep serving sizes in check. First bring a pot of water to a boil, then add the pasta. Boil the pasta just until it’s tender (7-10 minutes). 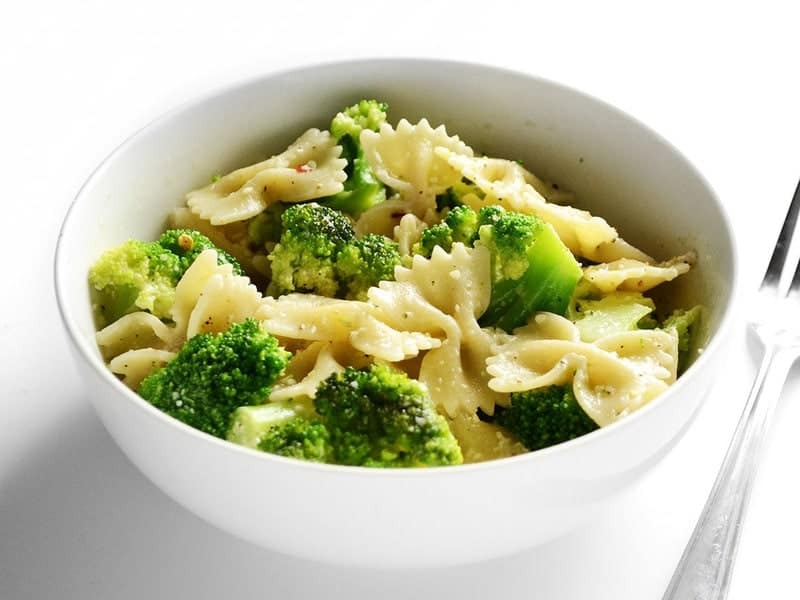 Once tender, add the frozen broccoli (estimate an equal volume to the pasta) directly to the pot and turn off the heat. Let it sit for a minute or two, or just until the broccoli is slightly tender, but has a bit of crunch left and is still bright green. If you prefer your broccoli a lot softer, you can leave the heat on for a minute or so and let it continue to boil, but I prefer mine to still have some tooth. 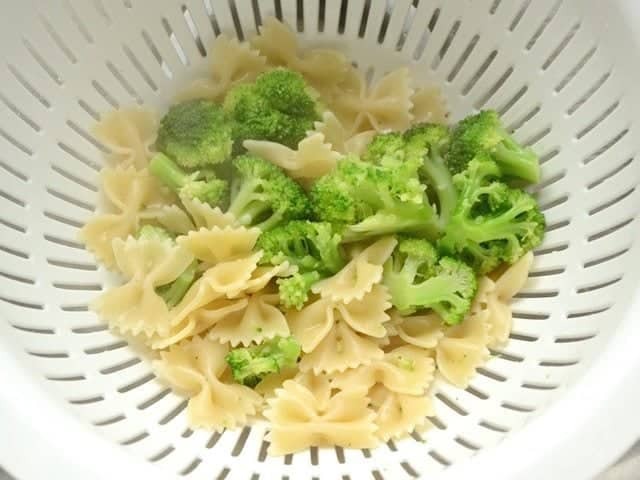 Drain the pasta and broccoli in a colander. 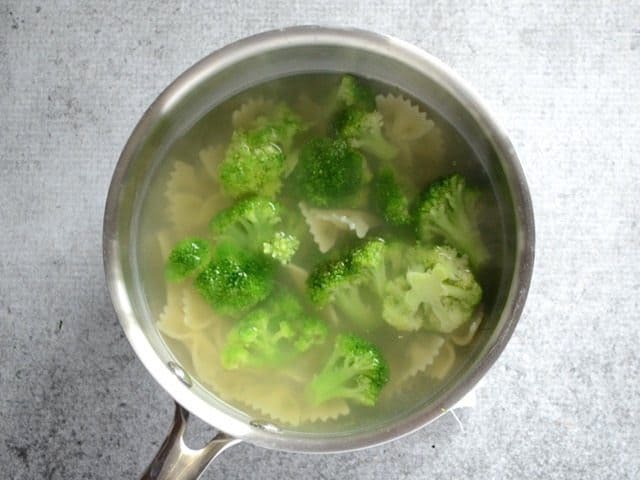 Transfer the drained pasta and broccoli to a bowl, or back to the cooking pot (with the heat off). Add 1/2 Tbsp butter for each serving you’re preparing, then toss until the butter melts and coats everything. Once everything is coated in melted butter, sprinkle 1/2 Tbsp grated Parmesan for each serving, plus salt and pepper to taste, and a pinch of crushed red pepper flakes (if desired). Toss briefly again so that everything is coated in Parmesan, salt, and pepper. Taste and adjust the seasonings if needed. Easy, enjoyable, and just over 50 cents per bowl! This is one of those insanely easy, everyone likes it meals that we have the ingredients for at all times in our home. It has saved us from the I’m lazy, let’s get take-out trap on sooo many occasions. Thank you Beth!!! I made this one a few weeks ago with broccoli and spinach and loved it. And I’m planning to make it again this week, though probably not with spinach because I’m out. But I might add some cannellini beans for an additional nutrient boost and flavor. We’ll see what I have in my pantry. I’ve even added this one to my blog (https://alongthecamelride.com/2018/11/12/how-to-eat-a-deliciously-healthy-diet-on-a-budget/) because it’s healthy, economical, and tasty. Thanks for a yummy recipe! Follow-up: I made this meal again this week and sauteed garlic in the butter this time. It was even better! As much as I love this recipe, I’m going to try it with EVOO just to see what it’s like. But I love this option as is and am sad I only have half a serving left. It’s a great combination of healthy comfort food. Perfect Monday meal. Quick and easy! Paired with a rotisserie chicken! Thank you for this delicious and easy recipe! Super quick to make and definitely budget friendly. My 7 year old even loved it. And the leftovers are always a plus for my family.